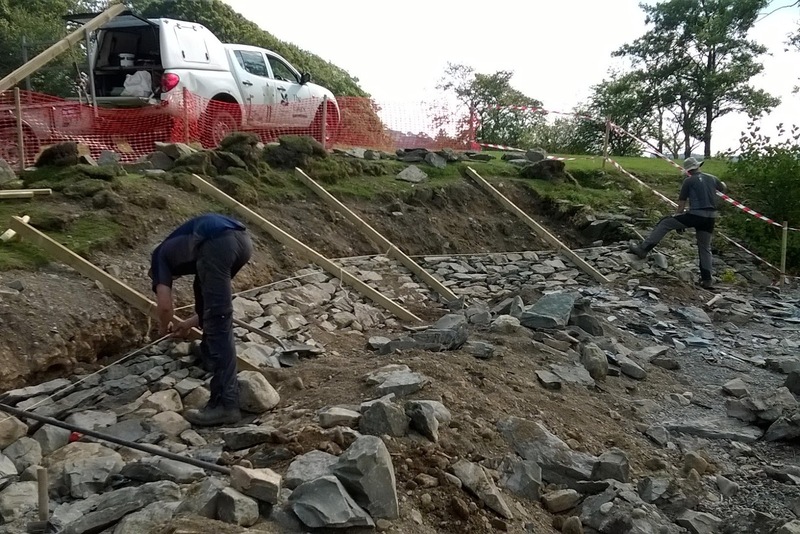 We've recently been replacing an old revetment at Cockshott Point on the banks of Windermere. It was put in place to protect the bank from washing away when the water level rises on the lake, especially after flash flooding. The original revetment was built back in the 1980's and was starting to look a bit worse for wear. Our first job was to remove the old revetment and salvage any useable stone. Some sections had also been cemented together so where possible we removed the rock from the cement. We brought in some new stone from a drystone wall that had been been dismantled and kept aside for future use. We also collected some rock from the edge of the lake that had obviously been pulled out of the revetment at some point. For the first course we dug in a deep line of stones as this would be the first line of defence against the rising lake and will help protect the rest of our work. We then positioned some wooden rails to help us keep line as we worked up the bank. 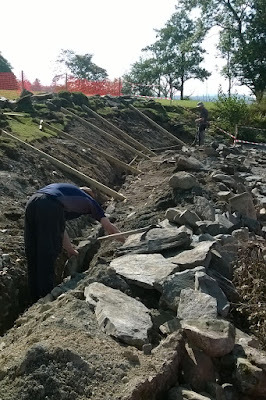 We progressed up the bank building one course on top of the other, similar to building a drystone wall. Once each section was completed we "leap-frogged" over each other to start work on another section. To improve access down to the shore we added a couple of low slate steps. Once all the work was finished we had a big clean up removing all the rubble and soil, and finally adding grass seed to the whole area.